On this episode, Brian rolls his character for the upcoming Drakkenland campaign in Castles & Crusades! On this episode of RPGLL, we streamed session zero of our Drakkenland Campaign. 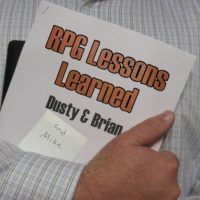 On this episode of RPGLL, Dusty and Mike continue their first BFRPG session, the Fortress of the Iron Duke. This one was a tough session.